This widely acclaimed book is a comprehensive and authoritative account of the history and ideas of the Frankfurt School - the most important and influential group of leftist intellectuals, philosophers and social theorists in Germany this century. 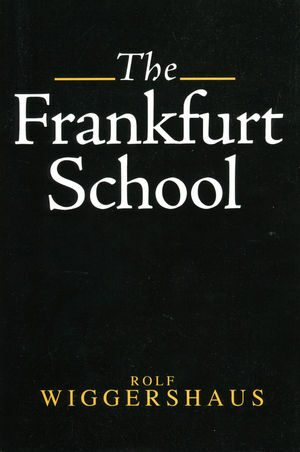 Wiggershaus traces the history of the School from its establishment in the early years of the Weimar Republic, through the period of exile in America, to the post-war phase in Frankfurt and the emergence of a younger generation of critical theorists in the 1960s. He combines biographical profiles of the key figures in the Frankfurt School - including Horkheimer, Adorno, Benjamin, Marcuse, Fromm, Neumann, Pollock, Kirchheimer and Habermas - with a rigorous analysis of their main theories and ideas. Through the careful use of documentary material, much of which has only recently become available, Wiggershaus is able to shed new light on internal disputes and controversies among members of the School. The Frankfurt School will be welcomed by students and researchers in the social sciences and philosophy, modern history and German studies, as well as anyone interested in the history and influence of the Frankfurt School. Rolf Wiggershaus is the author of The Frankfurt School: Its History, Theory and Political Significance, published by Wiley. 3. In the New World I: An Independent Institute of Critical Social Research. 4. In the New World II: Productive Decay. 6. Critical Ornament of a Restoration Society. 7. Critical Theory in Contention. 8. Critical Theory in a Period of Upheaval.